This paper was funded by the Global Development Network (GDN) and the Korea International Cooperation Agency (KOICA). It received the 2014 KOICA President’s award for best submission from a developing country. I am highly indebted to: (i) Prof. Eun Mee Kim for mentorship and constructive comments; (ii) two anonymous referees for constructive comments and (iii) Ms Savi Mull and Mr Vasundhra Thakur for logistics and networking coordination. Andrés, A. R., Asongu, S. A., & Amavilah, V. H. S. (2014). The impact of formal institutions on knowledge economy. Journal of the Knowledge Economy, Forthcoming. doi: 10.1007%2Fs13132-013-0174-3. Asongu, S. A. (2013d). Fighting African capital flight: timelines for the adoption of common policies. The Empirical Economics Letters. http://www.eel.my100megs.com/volume-12-number-10.htm. Accessed 30 Nov 2013. Asongu, S. A. (2014e). Financial sector competition and knowledge economy: evidence from SSA and MENA countries. 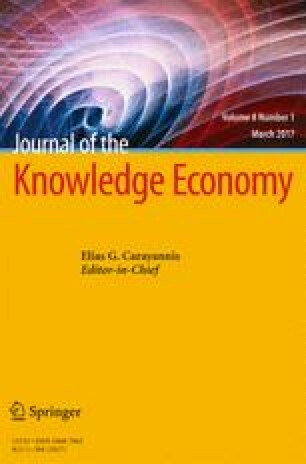 Journal of the Knowledge Economy, Forthcoming. doi: 10.1007/s13132-012-0141-4. Kim, S. (2013). Korea in Africa: a missing piece of the puzzle? (ed. Kitchen Nicolas) in Emerging powers in Africa, pp. 51–66. http://www.lse.ac.uk/IDEAS/publications/reports/pdf/SR016/SR-016-Kim.pdf. Accessed 14 Mar 2014. OECD (2008) Development cooperation of the Republic of Korea: DAC special review, (Paris: OECD). http://www.oecd.org/dac/peer-reviews/42347329.pdf. Accessed 16 Jul 2015. Oyelaran-Oyeyinka, B., & Gehl Sampath, P. (2007). Innovation in African development. Case studies of Uganda, Tanzania and Kenya. A World Bank Study. http://info.worldbank.org/etools/docs/library/239730/InnovationInAfricaFinalPaper.pdf. Accessed 22 Mar 2014. Pillay, P. (2010). South Korea. In Linking higher education and economic development: implications for Africa from three successful systems, (chapter 4) pp. 71–96. http://chet.org.za/books/linking-higher-education-and-economic-development. Accessed 14 Jun 2015. Suh, J., & Chen, D. H. C. (2007). Korea as a knowledge economy. Evolutionary process and lessons learned. Korea Development Institute. https://www.usp.ac.fj/worldbank2009/frame/Documents/Publications_regional/409300PAPER0KR101OFFICIAL0USE0ONLY1.pdf. Accessed 19 Mar 2014. Tran, M. (2011). South Korea: a model of development? The Guardian. http://www.theguardian.com/global-development/poverty-matters/2011/nov/28/south-korea-development-model. Accessed 14 Mar 2014. Van Wijk, J., & Junne, G. (1993). Intellectual property protection of advanced technology. U NU/INTECH, Working Paper No. 10. http://archive.unu.edu/hq/library/Collection/PDF_files/INTECH/INTECHwp10.pdf. Accessed 14 Jun 2015.